Thanks to the kind generosity of H.R. 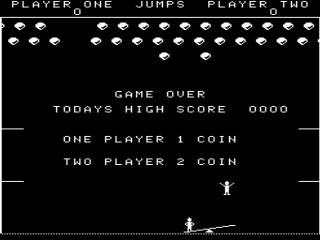 Kaufmann, president of Xidy, the original ROM images for Circus have been made available for free, non-commercial use. 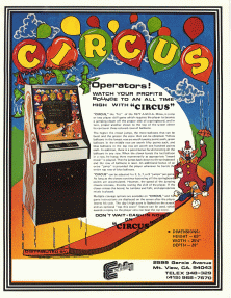 Circus was one of the first games produced by Exidy that used a CPU (6502) to control the game logic instead of hand-crafted hard-coded logic circuits. 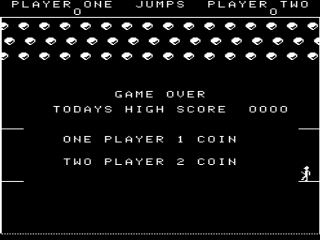 It ran on a black & white monitor with a color overlay that gave each row of balloons at the top of the screen a different color. 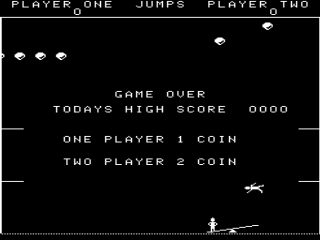 It was designed and programmed by Edward Valeau and Howell Ivey of Exidy in 1977. Circus came in an upright dedicated cabinet, and may have also been available in a cocktail configuration as well. Circus machines had white sides with red painted sideart of several balloons in flight. 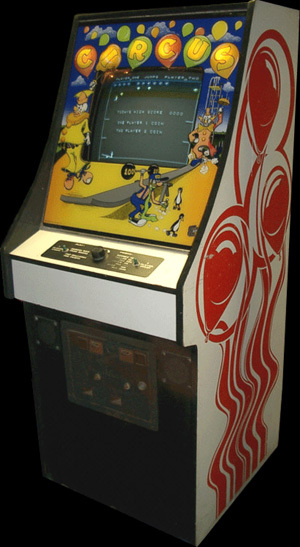 The front of the machine was decorated with a large ornate monitor bezel that also doubled as a marquee (or nameplate). 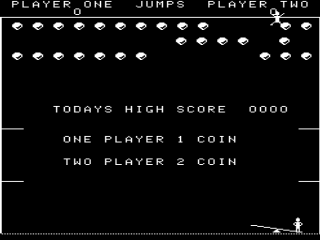 This bezel showed several clowns in a circus scene and had the game title spelled out with multicolored balloons. The control panel was unadorned, save for an analog spinner and a start button. The whole machine was finished off in black T-molding. At least 13,000 units, possibly as many as 20,000, were produced.